The many astoundingly beautiful monuments of the Giza plateau, along the Nile River in Egypt, display a remarkably precise set of engineering specifications and psychoacoustic effects that indicate an ancient biorhythmic synchronization network once operated on a global scale. Preceding the Dynasties of the Pharaohs by several thousand years, this global pyramid culture was a technologically advanced Sanskrit world nation that employed these giant crystalline structures to synchronize the pineal, hypothalamus and pituitary glands with the human heartbeat at temples and sacred sites worldwide. The striped, hooded headdress of the Great Sphinx references the hooded Kundalini cobra, an animal which is also seen extending from the third-eye, or ajna chakra of the female figure. These are unmistakable Sanskrit symbols and biorhythmic synchronization technologies that were later preserved in the monumental psychoacoustic architecture, hieroglyphic writing and cosmology of the Sumerian, Egyptian and Mayan civilizations. Bioelectrical stimulation of cellular metabolism enabled in the pyramid structures provided for the purification and rejuvenation of the body using a special, lighter form of water. In 1936, 1937, the Sphinx was covered up to the neck in sand; [this] was my playground - there were tunnels I used to walk, [and even] crawl in sometimes because it's narrow. At Abu Ghurab we have a crystal altar, a round disc in the middle of four [radial lines] - a symbol of 'hotep' - and the word 'hotep' means peace and food. This round disc is a lid on a shaft, about 180 feet deep to the level of the ocean and there is still running water in there and you can feel it while you are in the area. 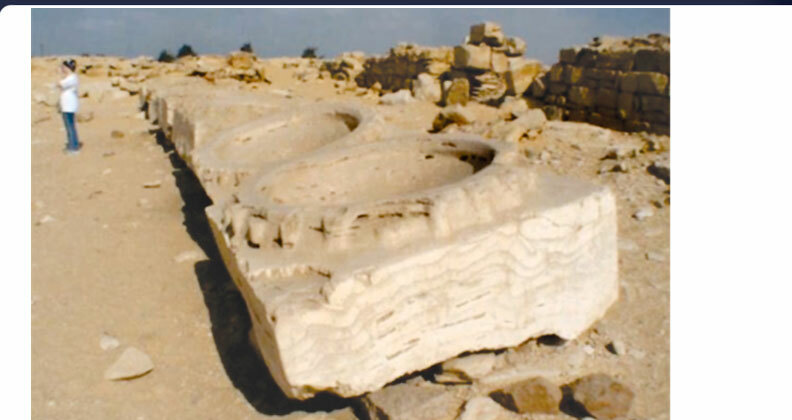 Limestone basins were also collected near the northwest corner of the remains of the giant obelisk at Abu Ghurab, each bearing identical forms and carefully rendered circular concavities (below). A view of the squared blocks from above reflects the ancient Sanskrit mandala of a circle within a square, while the strict adherence to geometry and identical forms of the many basins belies a complex mechanical purpose that has not yet been identified by modern Egyptologists or any independent researchers. 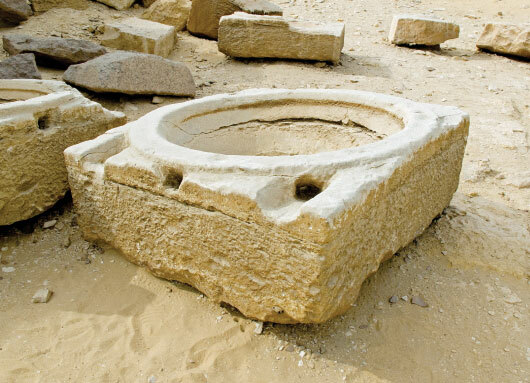 These many stone basins have remained a mystery for generations of modern Egyptologists, who claim the basins were used in the blood collection of ritual sacrifices. While no trace residues of blood have been found on any of the stone basins, this hypothesis is further complicated by the fact that the three holes are located near the upper rim of the basin, not at the bottom. 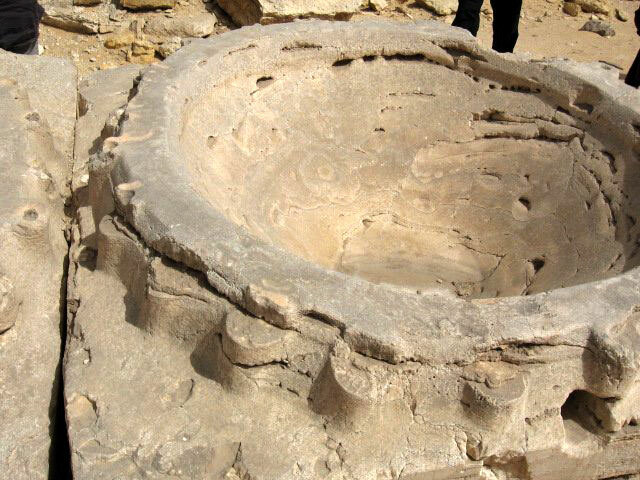 This feature indicates that the holes were not designed to let out blood from animals placed in the huge basins, but were actually used to fill the basins with water. But if the basins are filled without a drain outlet, where does the water go? The huge quartz basins were designed with one borehole centered on each of the four sides of the square bases of the instruments, while the comparable limestone examples display three machine-drilled holes on just one side of the square blocks. As well, the diameters of the bowls appear to be uniform, suggesting they were part of a large array that once surrounded the pyramids before being collected in groups by Egyptian authorities for present-day public display. 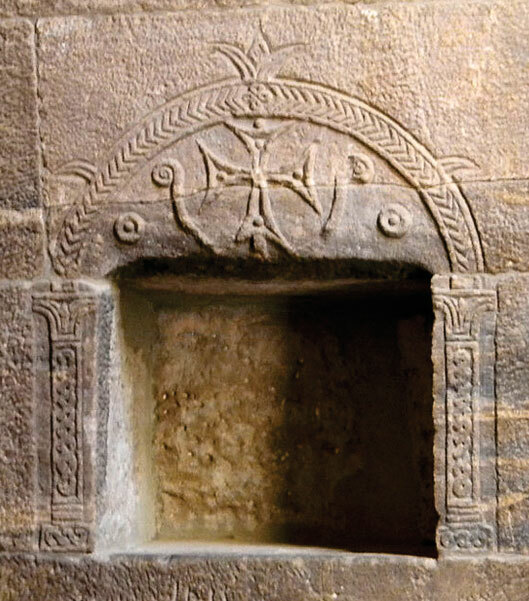 The identical dimensions and curvature of the many stone basins, with perfectly rendered geometric forms, gives the appearance of having been serially manufactured through mold-making processes rather than being quarried and carved in a solid state. Abundant evidence of this fact has been ignored for close to 30 years by much of the academic community, despite publication in scientific journals. The geopolymer research of Dr. Jacob Davidovits documents the lower density of the limestone blocks of the Great Pyramid, showing them to have been synthetically cast using a concrete-like slurry composed quite differently than all naturally sedimented limestone. The pyramid's massive limestone blocks contain an exotic admixture of opal CT, hydroxy-apatite and silico-aluminates that enhance the limestone's natural capacity to convert all atmospheric acoustic energy into an electrical current within the crystals, inducing a strong electromagnetic field around the pyramid structures and within their passages and chambers. Both the low density and exotic mineral composition of the limestone basins may reveal their synthetic nature, while the quartz basins bear drill marks that suggest they were quarried stones. The modular nature of the blocks suggests they were distributed around the pyramids as part of the original walled enclosure that once surrounded each of the three pyramids on the Giza plateau. The specific and exclusive use of piezoelectric calcite and quartz crystals for the construction of the pyramids themselves, and the large basins that once surrounded them in great numbers, relates to their transducive capacity to focus and amplify acoustic waves. Mechanical flexing occurs in the quartz and calcite crystals as a uniform structural deformation that generates standing waves within the stones' crystalline lattice, eventually building a strong electromagnetic field that allows acoustic levitation. The high-walled enclosure, resembling a courtyard, contained energetic waters identified by the local indigenous wisdom traditions as Lake Hathor. The lake waters were absorbed by the porous limestone of the pyramids, and provided direct electrical connection to the subterranean water table and thereby to the world's oceans. The pyramid texts of Saqqara describe this absorption of water within the stones in exact terms, stating that the pyramids' "foundations are the stones, the water..." The hieroglyphic inscription on the obelisk at Abu Ghurab reads "Heart of the Sun" in reference to the pyramid network's piezoelectric transduction of the infrasound resonance of the sun, at the 1.45 Hz frequency of the human heart at rest. Were the pyramids responsible for the regulation of global heartbeat patterns and weather patterns? Infrasonic stimulation of solar flare activity has been correlated to river flow and precipitation rates. Could it be that the pyramids were designed to increase atmospheric evaporation by heartbeat resonance? The high-resonance form of hydrogen is called protium, being the lightest hydrogen isotope, known for its powerful rejuvenative effects, in stark contrast to the cellular aging induced by heavy water. 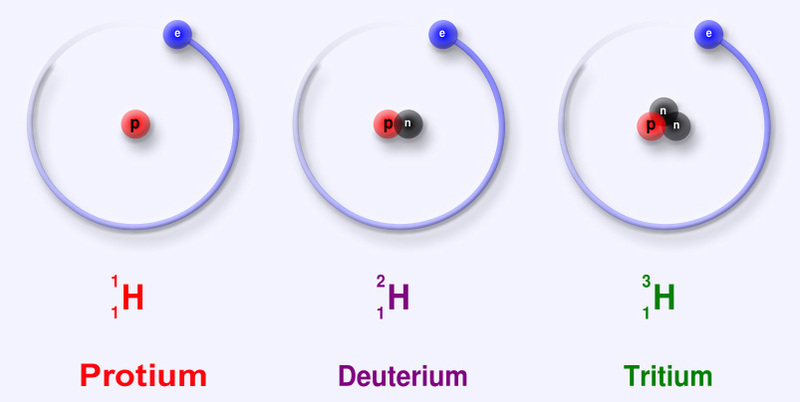 The levitation of water by solar-driven infrasound resonance allows separation of lighter protium water molecules from the heavier isotopes of deuterium and tritium (above). Acoustic engineers have developed small, concave piezoelectric transducers enabling the generation of standing waves for acoustic levitation. 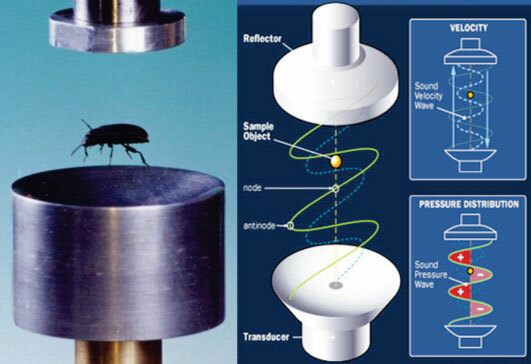 Both water and small living organisms (like the beetle, above) have been levitated using ultrasound, while the ancients used giant low-frequency transducers. During the conquest of the Americas, historian Garcilaso de la Vega documented the destruction of giant granite bowls at Inca sites in the Andes having diameters that exceeded the height of two men. Concave granite basins were also found in the passage chambers of Knowth, Dowth and Newgrange, in Ireland. Just as in the case of the pyramid chambers, the world's megalithic chambers also produced lightwater vapor. Tláloc is the return of vapor that strains to rise, is the return of time that strains to remember. 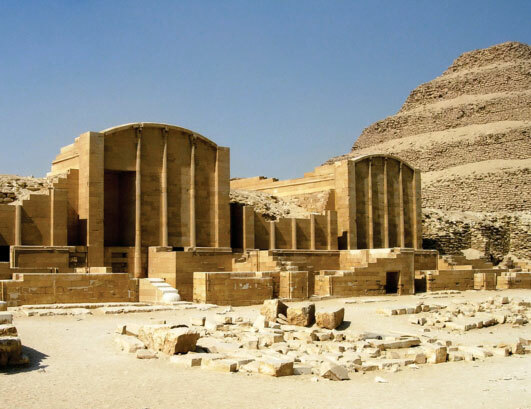 [Academics have claimed] these constructions... at Dashur, [to be tombs] related to a King called Seneferu... Now, when you come to the word 'seneferu' - sen means 'double', nefer is 'harmony', so it means 'double harmony'. It's not the name of a person - but it's the energy we get from these constructions! The Bent Pyramid has two different chambers for [producing] two different sounds." Awyan's training and intuitive understanding of the acoustic healing techniques practiced in the pyramids is explicitly tied to the concept of bi-frequency resonance within the range of the human voice, enabling the synchronization of the hemispheres of the brain. Known as binaural beating, this effect underlies the ancient Sanskrit kundalini tradition that originated in the antediluvian mother-culture of Atlantis, preserved throughout Egyptian art. 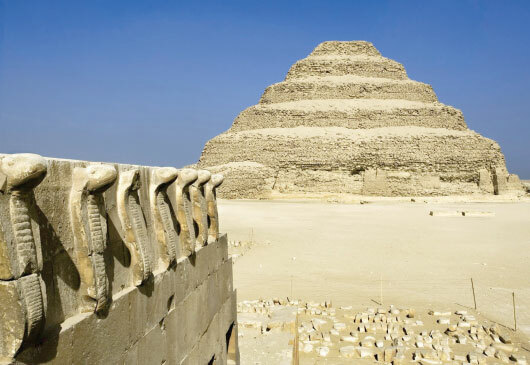 Kundalini cobras adorn the House of Spirit at Saqqara (above), suggesting the more ancient Sanskrit Atlantean origin of the megalithic enclosure and the later construction of the Step Pyramid inside it, as understood and passed down by indigenous Elders. The dimensions of the diagnostic chambers of the House of Spirit are calibrated to resonate at two offset frequencies within the range of the baritone voice that generate a difference tone, or beat frequency, at the 1.45 Hz human heartbeat rhythm. Biorhythmic resonance was thereby established and maintained between the ancient Vedic healer and the patient. Healers would place their heads into the small niches opposite the diagnostic platforms, placed at nodal points within the architecture, enabling the healer to remotely perceive the doshic imbalances of the patient. These open-air, high-walled piezoelectric structures were used for healing practices in combination with other chambers below the House of Spirit itself, as well as in the interior chambers of the pyramids and at distant megalithic monuments in alignment with the octagonal axes of the Great Pyramid of Giza. This unified resonant Vedic healing system was applied throughout the world's sacred sites, which comprise a vast global network designed to enhance human longevity. The resonant pumping of the fluids through the human body reflected the resonant evaporation of vast amounts of lightwater into the atmosphere. Lightwater was levitated into the sky from the arrays of large concave stone transducers surrounding the walled enclosures, and from the surface waters of Lake Hathor and the Nile River, to be distributed as a lightwater vapor canopy above the many focal points of infrasound standing waves. Lightwater vapor became ignited as giant luminous HHO plasma plumes that rose in brilliant swirling patterns into the sky above the pyramids, as recorded in the Mayan Tree of Life murals at Teotihuacan. The ultraviolet-A and infrared emissions of the HHO plasma would have caused the white limestone casing of the Great Pyramid to glow a brilliant white, due to the ultraviolet fluorescence of the calcite microcrystals. Along with high-resonance waters, the bioelectric enhancement of cellular functions allowed extended lifespans for those practicing the sacred barefoot lifestyle within the temple walls. This form of spiritual metabolism based on exposure of the body to weak electrical currents and strong electromagnetic fields is referred to directly by the concept of 'hotep', defined by Dr. Awyan as meaning 'peace and food'. The resonant heartbeat synchronization of the entire globe provides the telepathic link that engenders peaceful human relations, as hearts and minds are coupled into resonance. This peace concept is echoed in the term 'Arc of the Covenant', referring to the global biorhythmic 'agreement' of telepathy. Deep heartbeat booming emanating from the Giza pyramids resounded loudly at various bands of resonant focal points throughout the world network, based on the quadratic function [ zn+1 = zn2 ]. The distance from Giza to the Irish sacred sites of Newgrange, Knowth and Dowth is 10.0% of the Earth's mean circumference distance (of 24,892 miles). Stonehenge, England lies at the 9.0% distance from Giza, while the sacred stone temples of Teotihuacan, Mexico and Machu Picchu, Peru sit exactly along the 30.0% and 30.9% Fibonacci-based resonant distances from Giza. These perfect distance relationships reveal a systematic global alignment. The Temple of Isis at Philae was designed with very similar psychoacoustic architectural features, including a small granite altar right in front of a small cubical niche inset into the wall. 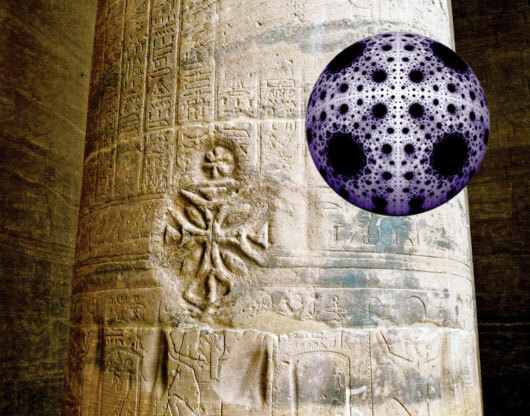 Both of these features are engraved with the sacred cross pattern, variously referred to in the Nile region as the Philae Cross (as well as the Coptic Cross, the Rose Cross, etc...) and corresponds exactly to the spherical Prime Cross rendering that I produced in 2006 (compared above), using the 2D octagonal quantum iterated function of Dr. A. Jadzyck. 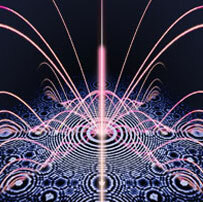 This spherical resonance formula has also been rendered in crop circle formations.